This is a rain scene created by use of four shower heads sprinkling a platform. 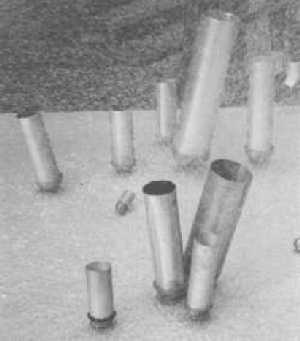 Twelve tubes being fixed on leaden semi-spheres represent twelve skipjacks. As a tube fills with rain it reaches a point where the skipjack topples over, dismisses the water in a gush and stands up again. The tubes have different size and cycle time each. For a long period all tubes may stand still. Then one may fall causing an avalanche. The sculpture is a joint work with Roland Hermanns, who joined also in creating the WasserChaosScheibe.